It is impossible to tell which is greater from the information given. 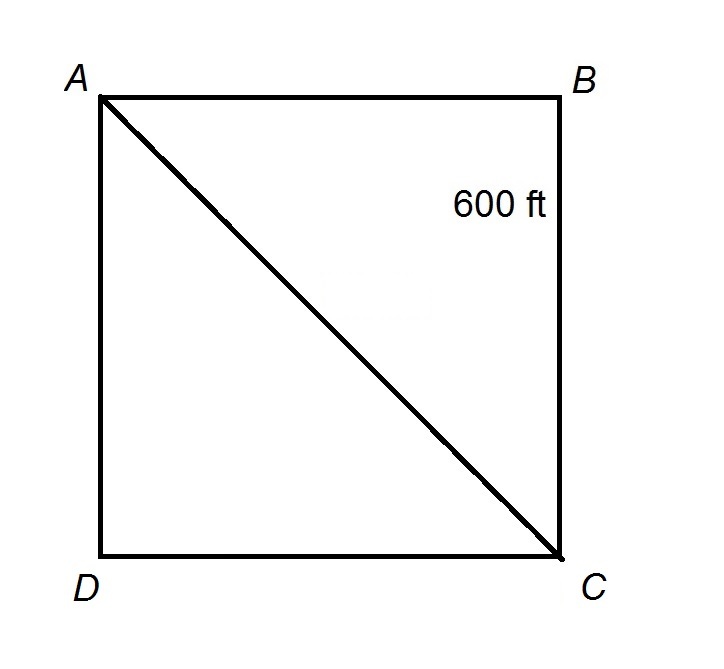 A diagonal of a square cuts the square into two isosceles right triangles, of which the diagonal is the common hypotenuse. 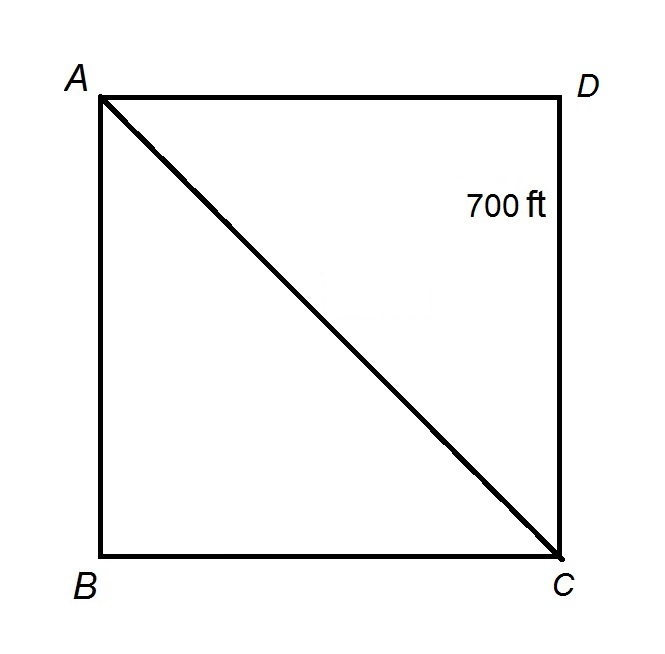 Therefore, each figure is the hypotenuse of an isosceles right triangle with legs 10 inches, making them equal in length. The track at Peter Stuyvesant High School is a perfect square, as seen above, with sides of length 600 feet and a diagonal connecting two of the corners. Les begins at Point A, takes the diagonal path directly to Point B, then runs counterclockwise around the square track twice. He then takes the diagonal from Point B back to Point A. Which of the following is closest to the distance he runs? Of the given responses, miles comes closest to the correct distance. The track at Franklin Pierce High School is a perfect square, as seen above, with sides of length 700 feet and a diagonal path connecting Points A and C.
Ellen wants to run three miles. Her plan is to begin at Point A, run along the diagonal path, run clockwise around the square track once, run along the diagonal path, run clockwise around the square track once, then repeat this pattern until she has run three miles. Where will she be when she is done? or four complete circuits and 0.17 of a fifth. She will now run along the diagonal from Point A to Point C, but since the diagonal has length 990 feet, which is greater than 629 feet, she will finish running three miles when she is on this diagonal path. The track at Grant High School is a perfect square, as seen above, with sides of length 600 feet and a diagonal path connecting two of the corners. Kenny begins at Point A, runs the path to Point C, and proceeds to run counterclockwise around the square track one complete time. He then runs again along the diagonal path from Point C to Point A.
feet. 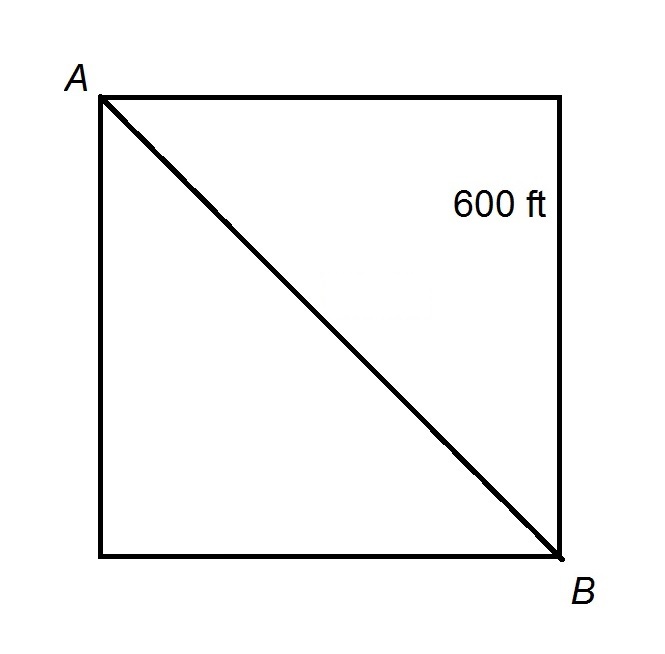 Since one mile is equal to 5,280 feet, the greater quantity is (b).